Ambassador Ravinatha Aryasinha, Sri Lanka’s Permanent Representative to the UN in Geneva and Leader of the Sri Lanka Delegation to the 23rd session of the UN Human Rights Council (HRC) delivering the national statement on Monday (27 May 2013), apprised the Council of progress with regard to reconciliation in Sri Lanka since its last session in March 2013, Sri Lanka’s engagement with the Council and its mechanisms and on Sri Lanka’s position with regard to thematic issues of relevance to the Office of the High Commissioner for Human Rights. The Sri Lanka delegation to the 23rd session includes Manisha Gunasekera, Deputy Permanent Representative in Geneva, Buwaneka Aluwihare, Deputy Solicitor General, and Priyanga Wickramasinghe, Counsellor in Geneva. The session which commenced on 27th May will continue until 14th June. At the outset, Sri Lanka wishes to associate itself with the statement made on behalf of the Non-Aligned Movement. My delegation takes note of the High Commissioner’s statement and is firmly committed to supporting the High Commissioner in the discharge of her mandate as contained in GA Resolution 48/141. 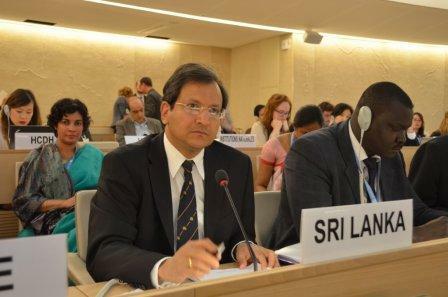 Sri Lanka urges the OHCHR to redouble its efforts in mainstreaming economic, social and cultural rights, which remain disproportionately marginalized, by allocating more financial and human resources to the promotion and protection of these rights. We reiterate the primacy of the role of the States Parties in the treaty body strengthening process. It is also important for the special procedures mandate holders to adhere to the Code of Conduct as stipulated in Council resolution 5/2 in the execution of their respective mandates, through a professional, impartial assessment of facts. We would like to see an equitable distribution of financial resources among all special procedures mandate holders through a transparent process to safeguard their independence. Sri Lanka notes the challenges faced by the OHCHR, particularly with regard to the budget which is paramount to the effective and independent discharge of the mandate of the High Commissioner. We believe that there is an urgent need for a more sustainable resourcing of the OHCHR in order to ensure efficient and objective fulfillment of its mandate under the administrative direction and authority of the UN Secretary-General and the General Assembly. To this end,Sri Lanka believes that the bulk of the OHCHR funding must come from the UN regular budget. Sri Lanka remains deeply concerned that the lack of financial independence of the OHCHR also leads to disproportionate attention being paid to country-specific action in the Council which selectively targets some countries, while situations, human rights violations and restrictive practices in other parts of the world that warrant more urgent and immediate attention and action remain conveniently ignored. The continuation and proliferation of the practice of the selective adoption of country-specific resolutions in the Council is a tool that exploits human rights for political purposes. We reiterate that such politicized action is contrary to the high purposes and principles of the Council and must be arrested. Regrettably, a similar pattern is evident in the case of continued action on Sri Lankain this Council. It would be recalled that the call for an international investigation into the situation in Sri Lanka emanated here barely a week after the Government’s defeat of LTTE terrorism which reunited the country 4 years ago. As we have already informed the Council during past sessions, the ill-conceived resolution on Sri Lanka resulting from politicized action, diaspora compulsions and reports not mandated by the inter-governmental process and therefore lacking in legitimacy and credibility, is completely unwarranted and is for that reason rejected by the Government of Sri Lanka (GOSL). The collusion, which is increasingly evident between some countries that support action against Sri Lanka and some extreme elements of the Sri Lankan Tamil diaspora with vested interests, is a concern that must be addressed more comprehensively by the OHCHR. The fact that some of these diaspora elements were accredited as members of a country delegation at the 22nd HRC sets an alarming precedent. Let alone not adding any value to the ongoing domestic reconciliation process, such action has caused mistrust about international processes among the people of Sri Lanka, and also negatively impacted our reconciliation efforts. – In the months of January, February and April 2013 of this year, GOSL has made public the continuing progress made in implementing the National Plan of Action towards the implementation of the recommendations of the Lessons Learnt and Reconciliation Commission (LLRC), the home-grown reconciliation mechanism inSri Lanka. In addition to the majority of the recommendations which were deemed most significant and incorporated in the National Plan of Action (NPoA) for immediate implementation by 22 key government agencies in July 2013, GOSL is presently in the process of integrating into the NPoA further recommendations made by the LLRC. – With the last batch of IDPs having been resettled in Mullaithivu in September 2012, and 23,398 choosing to live with host families, all 295,873 IDPs resulting from the ending of the conflict have been successfully integrated. – As at end March 2013, only 96 square kilometers remains to be demined, out of 2,064 square kilometers left contaminated with landmines and UXOs at the conclusion of the terrorist conflict. Over 961,447 explosive devices (anti tank – 1,459, anti personal – 523,797 and UXO – 436,191) have been recovered and the Sri Lanka Army was responsible for demining approximately 75% of the land. – Of approximately 12,000 ex-LTTE combatants who were arrested or surrendered at the end of the conflict, as of 15 May 2013, 11,551 persons, which included 594 child soldiers, have been rehabilitated and reintegrated into society. As of 15 May 2013, 374 ex-combatants including 18 female ex-combatants are undergoing rehabilitation. Among those rehabilitated, 212 youth who were previously pursuing tertiary education were re-inducted into the university system to follow their undergraduate studies. – Legal proceedings have been instituted against 194 ex-combatants who are under judicially mandated custody, remanded or enlarged on bail by Court. In order to expedite the cases of suspects that are in remand custody after serving indictment, the Government established 3 additional courts in Vavuniya, Mannar and Anuradhapura besides the Colombo High Court. Separate state counsels and dedicated staff including Tamil translators and typists have been allocated for this purpose. Furthermore, in order to file cases for the suspects that remain under remand custody pending indictment, a special committee has been appointed to look into their cases. The scope of this committee is to review and advice further legal proceeding of these cadres, including the possibility of release of suspects following rehabilitation. – The Government has also established a mechanism to ensure the right of information of the relatives of the LTTE suspects. A centralized, comprehensive database of detainees established by the Terrorist Investigation Division (TID) of the Police with units operating around the clock in Colombo, Vavuniya and Boossa enables next-of-kin (NoK) to receive details of detainees and those who are released from detention. It may be noted that this information is only provided to NoK, as detainees have requested that such information not be released publicly due to privacy concerns. Upto now, around 3,220 inquiries have been made by the relatives to the TID alone (486 phone call inquiries, 5 email inquiries and 2,729 physical appearances). 2,729 complaints have been recorded and 1,628 investigations have been completed and 1,101 investigations were in progress as of February 2013. – While ICRC access to prisons and detention centres where detainees under the Prevention of Terrorist Act (PTA) continues, the Ministry of Defense and the ICRC have also held a series of discussions on the issue of disappeared persons and continue to maintain a positive dialogue on areas of cooperation. In an ongoing operation, a Family Tracing and Reunification Unit (FTR) has been established in collaboration with UNICEF, primarily to trace missing children. The Unit recorded 2,564 untraceable persons out of which 676 were children, while 1,888 were adults. About 64 percent of tracing requests were reported by parents of children who had been recruited by the LTTE. to other parts of Sri Lanka/overseas, civilians likely to have been killed in cross fire and civilians killed by the LTTE whilst escaping from LTTE control, false reporting, found to be alive, deaths reported but not during the period of Humanitarian Operation and those who have gone overseas/moved to other parts of Sri Lanka/ untraceable etc. It would be recalled that from Jan – May 2009 around 2,400 Sri Lankan security forces personnel were killed and around 11,000 wounded, which indicates the intensity of the LTTE resistance at the time. The GoSL has embarked on a fresh survey on deaths, injuries, untraced and property damages as recommended by the LLRC NPoA and this survey is expected to provide vital information to respond to many questions raised related to deaths, injuries and those untraced during the conflict. – Pursuant to recommendations made by the LLRC, in relation to the killings of the 5 students in Trincomalee, investigations have been concluded and upon studying the material, the Attorney General has advised the Police to initiate non-summary proceedings, and the formal institution of these proceedings before the Trincomalee Magistrate is due to take place in the first week of June. The investigation into the killings of the 17 ACF aid workers is continuing. Further, an Army Court of Inquiry is presently investigating allegations made following the Channel 4 video footage, irrespective of its authenticity or otherwise. To date GOSL’s request that Channel 4 provide the original material used by them to help the investigation process, has not been acceded to. – The security forces presence in the Jaffna peninsula and the islands, which was over 50,000 personnel at the height of the conflict, has today reduced to approximately 13,200. While rationalization of this presence would be considered in line with the national security interests of Sri Lanka, efforts are also underway to explore possibilities to relocate troops in the Palaly cantonment and in other identified Government lands, in order to allow original owners to settle in their native lands. While some lands have been earmarked for use in the expansion of the Palaly airport – KKS harbour complex as part of the redevelopment of the area after almost 3 decades of conflict, owners of private lands acquired would be given compensation at market rates, and additionally alternate lands in adjacent areas. – To address issues pertaining to land, the Government is in the process of formulating the Terms of Reference of the Fourth Land Commission. In May 2013, as per the recommendations of the LLRC, the Land Commissioner General’s Department launched a special accelerated programme to resolve issues pertaining to state land in the Northern and Eastern provinces in the post-conflict context, in collaboration with Provincial Land Commissioners, Government Agents and Divisional Secretaries,. A notice issued by the Land Commissioner in this regard has been widely circulated in all three languages in order to inform the public of this initiative. – The economic growth rate and the share of the contribution to the national economy by the Northern Provincehave grown since the end of the conflict. The province recorded an economic growth rate of 22% in 2010, and 27.1% in 2011. The corresponding figure for 2012 is expected to be released in June. In 2012, paddy production in the Northern Province recorded an increase of 24% while the highest growth in marine fishery was also recorded from the Northern Province, which grew by 28%. The Government continues to focus on infrastructure development activities in the Northern and Eastern Provinces through significant public investment, in road construction, power generation and transmission, port development and extension of railway lines, etc. 139 destroyed and damaged schools were reconstructed and rehabilitated while 348 schools had been reopened in the Northern Province in 2012. On 14 May 2013, the 43-kilometre Medawchchiya-Madhu segment of the 106 kilometre long Medawchchiya – Thalaimannar railway line was commissioned under the first phase of the Northern Railway Project. The northern railway network was destroyed by the LTTE several times and the train service completely ceased operations after the 13th June 1990. – Following the conclusion of the Census in the Northern Province and preparation of the electoral register, elections to the Northern Provincial Council is scheduled to be held in September 2013. The Council may additionally wish to note that the High Commissioner for Human Rights has now decided to undertake a visit to Sri Lanka from 25 to 31 August 2013, in response to an invitation formally extended to her by the GOSL in April 2011.Sri Lanka considers this visit as part of its continued, transparent and proactive engagement with the High Commissioner and the OHCHR. We believe that the visit would enable the High Commissioner to experience at first hand the significant strides made and also efforts presently underway in the reconciliation process in Sri Lanka, in the relatively brief period of 4 years since the end of the ruthless terrorist conflict that decimated our nation and its peoples for 30 long years. We hope that through the visit, a platform will be built for constructive engagement between GOSL and the OHCHR, laying by the fallacies that have in recent years guided the UN system’s actions and engagement with respect to Sri Lanka and its reconciliation process. In conclusion, Mr.President, Sri Lanka looks forward to constructive engagement at the 23rd session of the Council. Mr. Samarasinghe,Sri Lanka Envoy, can you rebut the accusations given below by the USA? The U.S. Department of State’s International Religious Freedom Report describes the status of religious freedom, government policies violating religious belief and practices of groups, religious denominations and individuals, and U.S. policies promoting religious freedom. The reports, prepared by the U.S. Department of State, are submitted in compliance with the International Religious Freedom Act of 1998. Secretary of State John Kerry released the 2012 International Religious Freedom Report at 11:30 a.m. EDT on Monday, May 20, 2013, at the U.S. Department of State. The constitution and other laws and policies protect religious freedom and, in practice, the government generally respected religious freedom. The trend in the government’s respect for religious freedom did not change significantly during the year. In certain instances, local authorities failed to respond effectively to communal attacks, including attacks on members of minority religious groups. There were reports of societal abuses and discrimination based on religious affiliation, belief, or practice. Sporadic violent attacks on Christian churches by Buddhists and some societal tension due to ongoing allegations of forced or “unethical” conversions (i.e., the use of bribes to persuade people to convert) continued, although the number and scale of attacks were reportedly fewer than in recent years. Intolerance of, and discrimination against, Muslims by some Buddhists increased during the year. U.S. embassy officials conveyed U.S. government concerns about religious freedom, particularly attacks on churches, to government leaders and urged them to arrest and prosecute the perpetrators. The ambassador and other embassy officials also met regularly with representatives of all religious groups to review a wide range of human rights, ethnic, and religious freedom concerns. During meetings with religious group leaders, senior U.S. officials discussed religious freedom, including reconciliation efforts and harassment of minority groups. The U.S. embassy supported interfaith efforts to promote a peaceful resolution of the underlying causes of conflict, and the embassy undertook a number of projects promoting interfaith dialogue and cooperative engagement. According to a U.S. government estimate, the population is 21.5 million. Approximately 70 percent is Buddhist, 15 percent Hindu, 8 percent Christian, and 7 percent Muslim. Christians tend to be concentrated in the west, Muslims populate the east, and the north is predominantly Hindu. Most members of the majority Sinhalese community are Theravada Buddhists. Most Tamils, the largest ethnic minority, are Hindus. Most Muslims are Sunnis; there is a small minority of Shia, including members of the Bohra community. Almost 80 percent of Christians are Roman Catholic; other Christian groups include Anglicans, Seventh-day Adventists, Jehovah’s Witnesses, Methodists, Baptists, Pentecostals, members of the Dutch Reformed Church, and The Church of Jesus Christ of Latter-day Saints (Mormons). Although membership remains small, Evangelical Christian groups have grown in recent years. The constitution and other laws and policies protect religious freedom. According to the constitution, every person is “entitled to freedom of thought, conscience, and religion, including the freedom to have or to adopt a religion or belief of his choice.” The constitution gives a citizen “the right either by himself or in association with others, and either in public or in private, to manifest his religion or belief in worship, observance, practice, or teaching.” The constitution accords Buddhism the “foremost place” and commits the government to protecting it, but does not recognize it as the state religion. Religious groups are not required to register with the government. To conduct financial transactions and open bank accounts, however, they must be incorporated under the Societies Ordinance, under the Trust Ordinance, or by an act of parliament under the Companies Act. Until the 1960s, most churches were either Catholic or Anglican, and were incorporated by acts of parliament. Beginning in the 1970s, as new Christian groups emerged, the government more commonly registered churches under the Companies Act. Registration under the Societies or Trust Ordinances, while providing some financial benefits, limits a church’s ability to conduct certain financial transactions. Matters related to family law, including divorce, child custody, and inheritance, are adjudicated according to the customary law of the applicable ethnic or religious group. In order to solemnize marriages, religious groups must register with the Ministry of Buddha Sasana and Religious Affairs. Religion is a mandatory subject in the public school curriculum. Parents may choose for their children to study Buddhism, Islam, Hinduism, or Christianity. Students belonging to other religious groups may pursue religious instruction outside the public school system. All schools follow the Department of Education curricula on the subject, which is compulsory for the General Certificate Education Ordinary/Level exams. International schools following the London Ordinary/Level syllabus may opt not to teach religious studies in schools. The government observes the following religious holidays as national holidays: Buddhist Poya days (each full moon day is a Poya Day); Hindu Thai Pongal, New Year, and Deepawali festivals; Islamic Hadji and Ramadan observances, and the Birth of Prophet Muhammad; and Christian Good Friday and Christmas. There were reports of abuses of religious freedom. Although the government publicly endorsed religious freedom, in practice there were problems in some areas. Authorities were reluctant to investigate or prosecute those responsible for attacks on churches, Hindu temples, or mosques. While efforts to pass anti-conversion legislation reportedly declined, some Christian groups occasionally complained that the government tacitly condoned harassment and violence aimed at them. Police generally provided protection for these groups at their request. In some cases, the police response was inadequate and local police officials reportedly were reluctant to take legal action against individuals involved in the attacks. Some Christian groups, in particular newer denominations, reported an increase in complications obtaining local permission to construct church buildings. Evangelical groups reported it was increasingly difficult to register new churches or to reregister under the Companies Act. Several smaller congregations were denied permission to register with the Ministry of Buddha Sasana and Religious Affairs as churches during the year, reportedly because they were not members of the National Christian Council (NCC). This prevented them from obtaining authority to solemnize marriages. The National Christian Council, an umbrella organization representing “traditional” Protestant churches, coordinated often with the National Christian Evangelical Alliance of Sri Lanka (NCEASL), which represented the newer denomination churches. The government reportedly used membership in the NCC as an administrative obstacle to newer denominations. Local authorities sometimes did not want these groups operating in their districts due to allegations of so-called “unethical” conversions and pressure by local Buddhist groups. Some evangelical Christian groups reported incidents of governmental discrimination in the provision of services. Advanced-level public schools required all students to take a course in religion. Some government schools with small numbers of Christian students told their parents there were no teachers available to teach Christian-based religion classes, and therefore their children would be required to attend Buddhist religion classes instead. There were also reports of government schools refusing to enroll Christians on the basis of their religion. The government continued to limit the issuance of temporary work permits for foreign religious workers and clergy. Work permits for foreign clergy were issued for one year, rather than five years as in the past, but could be extended. Religious tensions continued in the north following the conclusion of a 27-year conflict between the Buddhist-majority government and the Hindu-majority Liberation Tigers of Tamil Eelam (LTTE). Government troops continued to build Buddhist shrines in Tamil areas of the north. Some Tamil groups alleged this demonstrated government-sponsored Sinhalese colonization of former LTTE-held areas. The number of Buddhist statues, viharas, and stupas in the northern districts of Jaffna and Kilinochi increased during the year. In November the Sri Lankan Army warned Tamils against celebrating Kaarthigai Deepam, a Hindu festival of lights. The festival coincidentally fell on the same day as “Heroes Day,” which commemorated fallen LTTE fighters. The military reportedly attempted to curb participation in the northern districts of Jaffna and the Vanni, instructing temples and the public not to light lamps and not to toll bells. The Department of Buddhist Religious Affairs provided financial assistance to maintain temples in remote areas and conducted religious school tests and teacher training examinations. It also assisted in the conduct of Buddhist ceremonies at national events. The Department of Christian Religious Affairs developed infrastructure facilities at places of worship and provided financial assistance to churches in need. It also conducted evaluations of teachers providing instruction on Christianity. The Department of Hindu Religious Affairs gave financial assistance to reconstruct temples destroyed during the conflict in the north and east, developed Hindu Aranery Schools (religious-based primary schools), and conducted seminars and workshops for teachers of Hinduism. The Department of Muslim Religious Affairs organized Muslim religious events, contributed towards development needs of Islamic institutions, and issued identity cards for Islamic clergy. It also issued letters of recommendation for students pursuing Islamic studies in foreign countries. On June 11, a nongovernmental organization (NGO) reported that a 14-year-old Catholic student attending a Buddhist school was beaten by his teacher, a Buddhist monk, in Kandy district. During a Buddhism class, the boy (the only non-Buddhist in the class) was called upon and questioned on Buddhist history by the monk. In response to the boy’s lack of knowledge of Buddhism, the monk reportedly struck the boy. The boy was subsequently hospitalized for four days. The father filed a complaint with the police, but authorities had not begun an investigation by year’s end. There were reports of societal abuses and discrimination based on religious affiliation, belief, or practice. Although discrimination based on religious differences was much less common than discrimination based on ethnicity, societal discrimination based on religious belief increased during the year. In general, members of different religious groups tended to be tolerant of each other’s religious beliefs, although there was at times an atmosphere of distrust. Incidents such as the destruction of places of worship by Buddhist monks exacerbated such tensions. A survey by the Asia Foundation, an international NGO working in the country, found that religious tension continued to be a problem among Muslim, Tamil, Christian, and Buddhist groups. Sixty-four percent of those surveyed believed that attempts to convert people from one religion to another should not be tolerated, a perception that was relatively consistent across all religious groups. The survey also found that religious minorities considered themselves free to express religious opinions in their local areas; however, higher percentages of Muslims and Hindus did not feel free to express religious opinions in public. Christians, particularly those from evangelical denominations, sometimes encountered harassment and physical attacks on property and places of worship by local Buddhists who were opposed to conversion and believed Christian groups threatened them. The number and severity of the attacks reportedly diminished somewhat during the year. The NCEASL reported attacks on Christian churches, organizations, religious leaders, and congregants; many of the attacks were reported to the police. Credible sources confirmed some of these attacks. On December 9, in the southern town of Weeraketiya (Hambanthota District), a mob of approximately 350 persons led by up to 80 Buddhist monks stormed and attacked a church during services. The mob caused serious damage to furniture and equipment within the building, as well as to vehicles belonging to church members. The attackers injured the pastor and reportedly assaulted two police officers when they attempted to stop the violence. Authorities deployed additional police and soldiers to control the mob; however the police made no arrests. One day prior to the Weeraketiya violence, a group of Buddhist monks and laypersons had visited the church and informed the pastor that he could not conduct Christian worship in the town without permission from the Buddhist clergy. The monks issued an ultimatum to the pastor to stop the church services, and threatened to destroy the church. Buddhist monks were under the protection of the ruling coalition government. Some monks, particularly outside the capital of Colombo, operated with impunity in trying to eliminate Christian and Muslim places of worship. At least 50 incidents of violence against Christians were recorded by Christian groups during the year. On August 9, for example, a mob attacked the pastor of an Assembly of God church, as well as his wife and a female worker of the Methodist church in Deniyaya. On August 19, independent media reported that Buddhist monks forcibly occupied the premises of a Seventh-day Adventist church and converted it into a Buddhist temple in Deniyaya town in Southern Province’s Matara District. On August 27, a mob of approximately 100 people assaulted two church leaders outside the Deniyaya police station for reporting the incident to the police. The case was under investigation at year’s end. NGOs reported several incidents of discrimination against Muslims. On April 20, Buddhist monks attacked a Dambulla mosque during Friday prayers, claiming the mosque (built in 1962) was an illegal structure built on sacred Buddhist land. Reportedly, the government ordered the removal of the mosque. On May 25, around 250 Buddhist monks gathered at a mosque in Dehiwala and began throwing stones and rotten meat over the gate. The protestors demanded the closure of the mosque, claiming it performed regular animal sacrifices, an accusation the mosque denied. The mayor of Dehiwala called for an inspection, and reported he found the mosque to be an illegal construction. In July during Ramadan, Buddhist monks forcibly entered a mosque in Kurunagala and demanded it be shut down. Members of the mosque filed a complaint at the Welawa police station, and subsequently the police ordered the mosque to be shut down. U.S. embassy officials conveyed U.S. government concerns about religious freedom, particularly attacks on churches and mosques, to government leaders and urged them to arrest and prosecute the perpetrators. The ambassador and other embassy officials also met frequently with representatives of all the country’s religious groups to discuss a wide range of human rights, ethnic, and religious freedom concerns. Embassy officials met with displaced Muslims and other citizens in the Puttalam area multiple times during the year to discuss ongoing efforts to return these displaced persons to their areas of origin or resettle them in host communities. The U.S. government strongly supported political reconciliation, and the embassy encouraged interfaith efforts by religious leaders to promote a peaceful resolution to the underlying causes of the conflict. The embassy undertook several projects to promote interfaith dialogue and cooperative engagement, including interfaith panel discussions, workshops, and other events. These events involved key regional religious leaders and reached several thousand participants. The ambassador met with religious leaders to discuss efforts for further development in the war-affected north and east. The ambassador and other embassy officials also regularly participated in religious conferences, ceremonies, and other events promoting religious freedom around the country. Ravinatha Ayasinha has attempted to whitewash the Rajapakse Regime but the world knows the truth. Seems a lot of white skin Sinhalese people are representing the country now.